An invitation to a long distance charity swim in Durban’s delectably warm ocean isn’t something one can ignore, and thank goodness I didn’t! 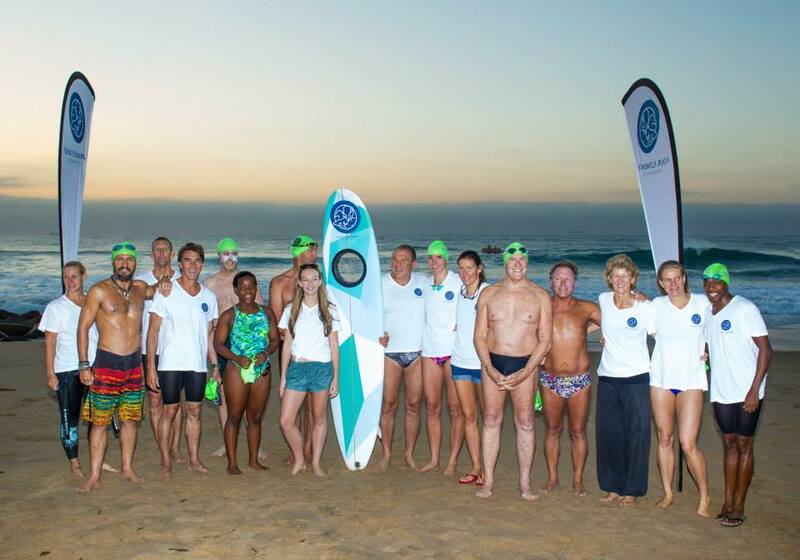 The Four Elements Ocean Challenge, an initiative by 17 year-old schoolgirl Olivia Taylor, had it all – an intrepid group of accomplished open water swimmers (including old friends Otto Thaning and Roger Finch, and many new friends in swimming! ), some chop, waves, good distance, sea life galore and a brilliant view of the Durban beachfront with its Miami-in-SA feel. The official distance of this brand new open water swim from Blue Lagoon to the harbour wall was 6km, which basically covers the whole shark-netted stretch of the Durban coast. For good measure (and to see if them shoulders can still exceed the 10km mark! ), I swam back, finishing the 12km double in just over 3 hours. Oh, and we started with a little 1km group warmup before the official start of the swim, so I’m ticking 13km! But enough about me. Today belongs to a young lady whose overwhelming passion for the environment has lead her to do things that are not only extraordinary for someone her age, but an example to people across the board. Olivia Taylor founded the Four Elements Conservation NGO at the age of 15, and has not only raised hundreds of thousands of Rands for various causes which represent the “four elements” of water, earth, air and fire, but has taken a strong stand against human misuse of our environment. The Ocean Challenge is not merely a swimming event through which funds and awareness was raised and fun was had by all, it is also an out-the-box initiative aimed at contributing to awareness and activity around World Oceans Day which is celebrated internationally on 8 June. To this end, Olivia is producing a short film which will feature the swim, with spectacular footage of the route, the swimmers and the surroundings, as well as interviews with the swimmers and other role players, and related activities including shark net free diving and a sand art competition. The release of this production will coincide with World Oceans Day. I don’t know where Olivia finds time for her school work, although I suspect she doesn’t need to put in too many hours in that department; it probably comes as naturally as arranging a challenging ocean event, producing her own short movie, or philosophising about preserving the world we live in. What a remarkable inspiration to the youth and anyone who cares about the environment; if my two daughters one day display some of Olivia’s passion, drive and discipline, I will be extremely proud. Olivia’s modest attitude of “If I can do it, anyone can…” does not quite do her justice, but then again, there isn’t much space for ego when one’s mission is sincere.